The tradition of the Beethovenfest Bonn stretches back to 1845, when a three-day music festival was held on the occasion of the dedication of the Beethoven Monument on the city’s Münsterplatz to mark the 75th anniversary of the composer’s birth. Both Franz Liszt and Louis Spohr conducted, and international guests in the audiences included King Frederick William IV of Prussia, Queen Victoria of Great Britain, the explorer Alexander von Humboldt and the composer Hector Berlioz. In a record time of just eleven days, a first Beethovenhalle was built to provide an appropriate venue for this first Beethoven celebration. The timber hall was demolished soon after the festival as a potential fire-risk. The second Beethovenfest was planned for the composer’s centenary in 1870, but because of the Franco-Prussian War, it was postponed until the following year, when it was held in a newly built Beethovenhalle. Then the “Verein Beethoven-Haus” (Beethoven Birthplace Association, formed in 1889) initiated chamber-music festivals in 1890 and 1893. 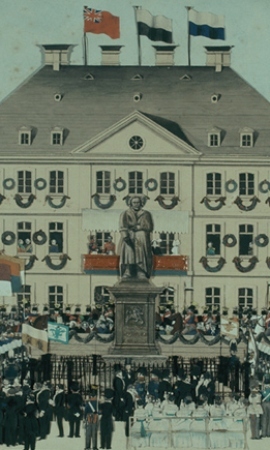 Led by the famous violinist Josef Joachim, the association celebrated the acquisition of Beethoven’s birthplace with the 1890 festival, and in 1893, the opening of the Beethoven Memorial in the building. 1894 witnessed a larger Beethovenfest: for the first time, all nine Beethoven symphonies were performed. In 1927, under the joint patronage of the German and Austrian presidents, a “Deutsches Beethovenfest Bonn 1927” was held to commemorate the centenary of Beethoven’s death. The modern-style Beethoven festivals in Bonn were initiated by the pianist Elly Ney. They began in 1931 with three “volkstümliche” Beethoven Days in Bonn. The word “volkstümlich” means “popular”; the concept is explicitly non-elitist. The chamber-music festivals organized by the Verein Beethoven-Haus, held annually from 1934 until the end of the war in 1945, were increasingly integrated into the Beethoven Festivals, which were devoted to orchestral and choral music but used as a propaganda vehicle by the Nazis. 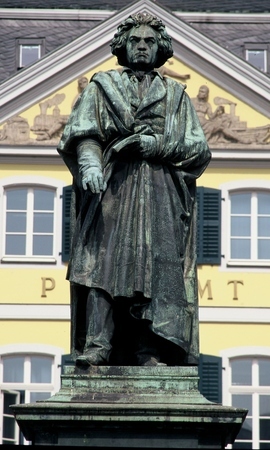 It was largely on the fame of the chamber-music festivals, initiated by Joseph Joachim, that the importance of Bonn as Beethoven’s city rested in the first half of the 20th century. The end of the war marked a new beginning. The city became the sponsor of the event, and artistic responsibility was transferred to the incumbent General Musical Director. In 1947 the city council resolved to hold the Beethovenfest and the chamber-music festival in alternate years. As early as 1959, it was possible to move out of the various temporary venues into the new Beethovenhalle, and the festival became, definitively, an autumn event. Top performers appeared at two or three-yearly intervals: conductors such as Böhm, Karajan, Bernstein and ensembles from all over the world found a musical tryst in Bonn. From 1974 the Beethovenfest was held every three year and devoted itself increasingly to a confrontation or comparison between Beethoven’s works and contemporary music. A stretched budget forced the city of Bonn to cancel its grant to the 1995 festival. Thereupon an association initiated by Bonn citizens, “Bürger für Beethoven” (Citizens for Beethoven), which is still in existence, organized a “Beethoven-Marathon”, which was held three times, lastly in 1998. The formation in 1998of a non-profit limited company, the Internationale Beethovenfeste Bonn gGmbH, created a sponsor and organizer of an annual Beethovenfest Bonn which attracts world-famous performers and highly talented new blood to the city. Characteristic of the festival, alongside the outstanding performers, are the themes which are always derived from Beethoven’s life and work, and the variety of venues. These range from historic to modern concert-halls, from the Beethoven-Haus and the Beethovenhalle to the Altes Wasserwerk (the “Old Waterworks”, which was also the final home of the German parliament before it moved to Berlin), from the venerable Bonn Minster to the T-Mobile Forum. Franz Willnauer was the Intendant (Director General) of the Beethovenfest Bonn from 1999 to 2003. He was succeeded in Januar 2004 by Ilona Schmiel. Born in 1967, and a concert manager by profession, she had previously been in charge of the Bremen concert hall “Die Glocke”.